Congratulations to Applied Research Center (ARC) – Department of Defense (DoD) Cyber Fellows hackathon team for winning the ShellHacks 2018 Oath challenge. 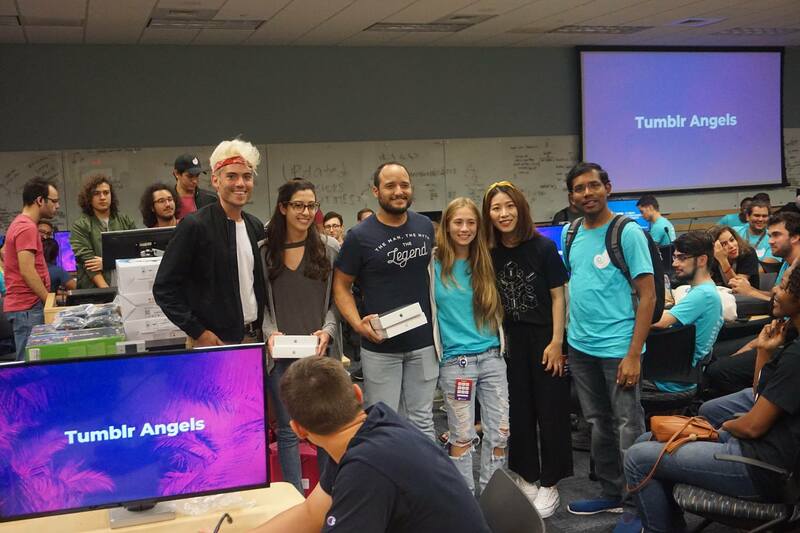 ShellHacks is a recently-created annual hackathon held at Florida International University (FIU) during the month of September. The goal at each hackathon is to work in small teams to “hack together” a novel solution to a problem with the prospect to win prizes, recognition or both. This year, members of ARC’s DoD Cyber Fellows team participated in ShellHacks 2018. This group consisted of Valerie Guerra, Andrew Santezenea and Paul Molina working on the Department of Defense (DoD) – Test Resource Management Center (TRMC) sponsored research project. Victoria Guerra, an undergraduate computer science student at FIU, joined as the fourth member of the team. This team chose to participate in the Oath challenge. Oath is a subsidiary of Cellco Partnership, otherwise known as Verizon Wireless, and is tasked with overseeing its parent company’s Yahoo and AOL acquisitions. Yahoo acquired Tumblr, a social media platform where users post personal blogs, in 2013. The Oath challenge specifically required the team to use the Tumblr API in a unique and novel way. The team responded to this challenge by creating TumblrAngel, an active sentinel which monitors users’ posts to detect whether or not they are a danger to themselves or others. When such warning signs are detected, the sentinel sends a private message to the user with a list of resources that they may contact for help. To accomplish this development task, the team first extracted recent posts made to the Tumblr API and ran sentiment analysis on the contents. The extraction mechanism was created by Paul Molina and was sent to a data analysis module created by Valerie Guerra and Andrew Santezenea. The tools developed by the team were written entirely in Python and utilized knowledge gained at the Applied Research Center to complete the challenge.